1. Peel and slice all but 1/3 of one of the cucumbers into 1” slices and put them in a blender or food processor with the salt, ginger and spices. Puree the cucumber until it’s pretty smooth. 2. The remaining 1/3 of the cucumber should be peeled and remove the seeds. Chop this into small matchstick-size slices and set aside for later. 3. 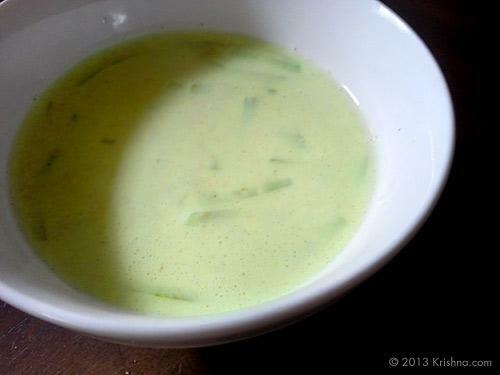 Add the yoghurt to the cucumber puree and puree further until everything is combined nicely. 4. Add the chopped 1/3 of cucumber slices from step 2, then cover and refrigerate at least two hours. This helps marry the flavors. Serve chilled or room temperature. You might also like to try adding a spring of fresh mint or a little fresh cilantro at step one. The mint is used in Middle Eastern recipes, and the cilantro is popular in the Mediterranean areas.